It’s Burger Week! Well, by the time you read this, it will no longer be burger week. It will be just some week. But for me, as I type these words in the past, it is Burger Week. And as far as weeks go, they can get a lot worse. The Oinkster in the Eagle Rock neighborhood of Los Angeles is a “slow food fast” restaurant, which is supposed to mean they serve food that tastes as though a lot of time and care has gone into it, despite the speed in which it arrives at your table. But today The Oinkster is a “slow food slow” restaurant, because much of Los Angeles has shown up for their annual Burger Week. Believe me, I’m not complaining. The premise is this: The Oinkster is proud of their burgers, and once a year they craft seven unique, not-normally-on-the-menu burgers to satisfy their creative urges and my stomach. Each day, a different burger is showcased. 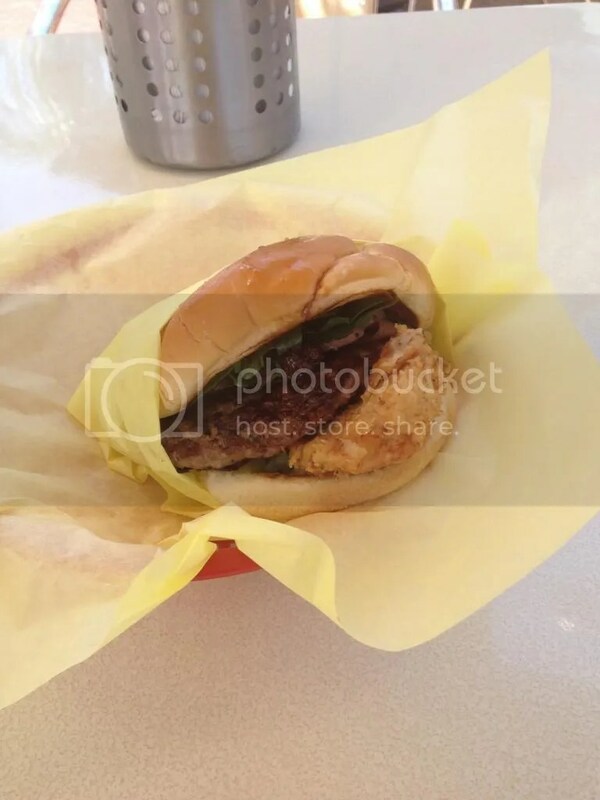 To LA burger enthusiasts, this week is truly special, leaving participants anxiously awaiting the new burger profiles and clamoring for the burgers of old. If you, burger-loving reader, can make it to The Oinkster all seven days of Burger Week, you get a t-shirt and the title of #BurgerLord. Read on, constituents of my lordship. I shall tell ye of my quest become a #BurgerLord. On the first day of Burger Week, The Oinkster gave to me (for the almost reasonable price of $14.44), the Cheesesteak Burger of Philadelphia. This burger, topped with sliced Nebraska Angus chuck (think the meat from a Philly Cheesesteak), provolone cheese, and grilled peppers and onions. There were things to like and not like about it, thus I ended up somewhere in the middle. For starters, the bun was soft, yet sturdy enough to hold a moderately greasy burger (thanks mostly to the sliced Philly cheesesteak meat) together easily. Taste-wise, it did not grab my attention one way or the other. It was merely functional. I appreciated The Oinkster’s generosity with meat, piling the sliced chuck atop the burger patty. However, the sliced beef added no new flavors to the burger. I had trouble distinguishing the patty itself from the sliced chuck. The grilled peppers and onions were good, and provolone is my favorite cheese, so no complaints there. But all in all, the patty and sliced chuck came together to make this burger very one-note. It was a pretty good, but definitely not great, start to Burger Week, and it successfully whetted my appetite for a week’s worth of burgers. 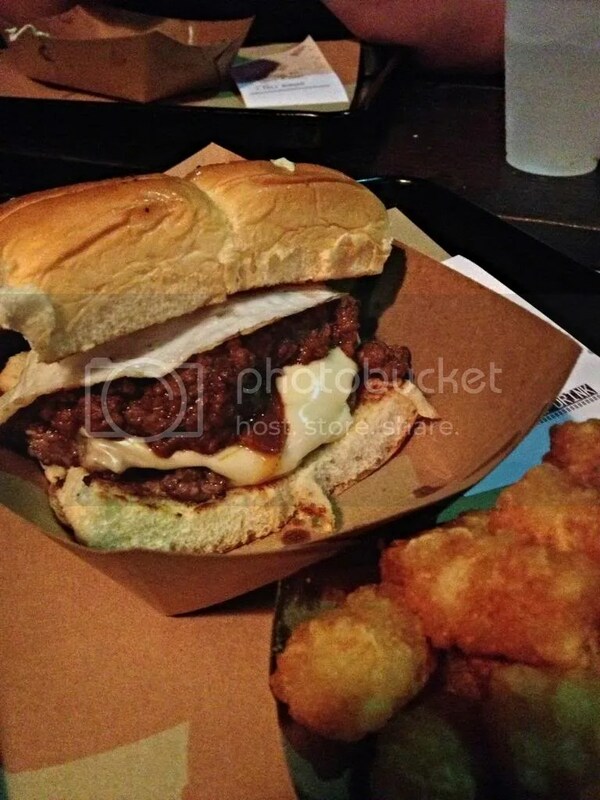 On the second day of Burger Week, The Oinkster gave to me a HotBurg on a Stick, a cornbread battered, deep-fried angus patty stuffed with cheese. The Oinkster went full-on fair food on Tuesday, and as an Ohio native who had his twelve year streak of Ohio State Fair attendance broken upon moving to California, I was excited about it. 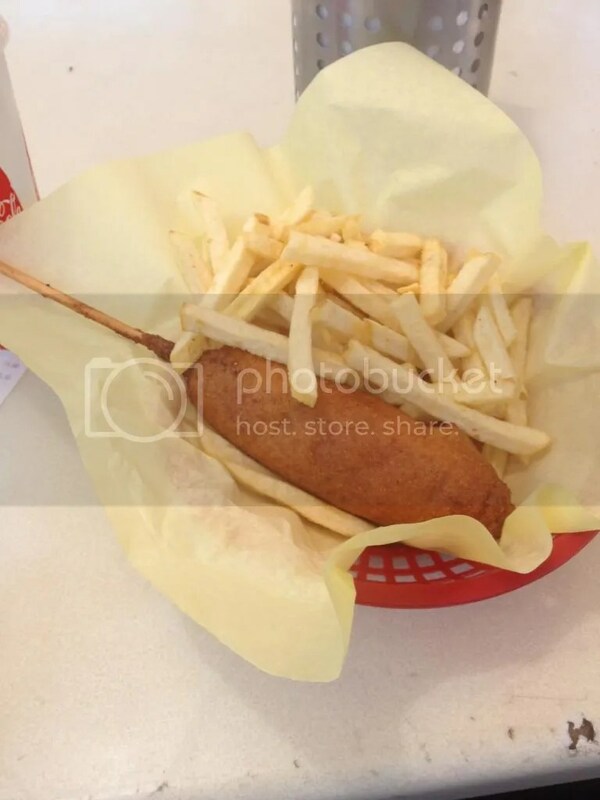 There were no butter cows to be found, but there was fried food on a stick. What could go wrong? As it turns out, a lot. I’ll start with the good. The cornbread batter was an inventive approach to the bun, and it was delicious – crispy, with a great balance of sweet and salty. But even the batter was flawed. After a few bites, it didn’t hold up on the stick. It tore and slid, and I was forced to manually hold it to the stick to get a cohesive bite. Inside the batter was an Angus patty stuffed with cheese. What kind of cheese? I couldn’t tell you, but if I had to guess, I’d say “Hamburger Helper Powder”. Honestly. Take away the noodles in the cheeseburger flavored Hamburger Helper mix, and you’ve got the contents of the HotBurg. The meat was subpar – barely seasoned, clumpy, and all-at-once completely bizarre. The cheese was watery and very un-cheese-like. The limited-time-only Limeade they served with the burger had been prepared well in advance, to the point that the ice in my cup was almost completely melted when I received it. As a bonus, it tasted a lot like Kool Aid. When I was seven, I loved Kool Aid, and I had similar feelings for Hamburger Helper. But I’m an adult now, and so are the people who prepare the food at The Oinkster. The HotBurg gets points for creativity, but the execution gets a large, gloved, Hamburger Helper thumbs down. On the third day of Burger Week, The Oinkster gave to me the Turducken, a turkey patty topped with a chicken breast, duck pastrami, cherry gastrique, and rosemary garlic relish on a potato bun. Recently, I went to a Jason Mraz concert, and it was the strangest, saddest concert I’ve ever been to. Jason (can I just call him by his first name?) spent the majority of the evening playing songs from his album to be released in July, entitled Yes!, and from his most recent album, Love is a Four Letter Word. Here’s the thing about these two albums, though. The casual listener doesn’t know anything about them, and they’re not very good. Eventually, in the encore, he closed out the night with I’m Yours, his most recent relevant single. And yet, despite being disappointed when he unveiled a song about dirt – literally, just dirt – I was not truly sad until I’m Yours. As soon as he played the first few notes, the crowd ignited. This was the first song he played that they cared about. I thought about how that must feel – to show a new set of songs you’re truly proud of, and have an entire auditorium meet them with blank stares. And I vowed to never again confuse unfamiliar with terrible. When I told friends about Wednesday’s Burger Week offering, they thumbed their noses at it. A burger with cherries on it? Gross. But I didn’t want the Turducken to fall victim to Jason Mraz’s fate – to be laughed off because it wasn’t familiar. 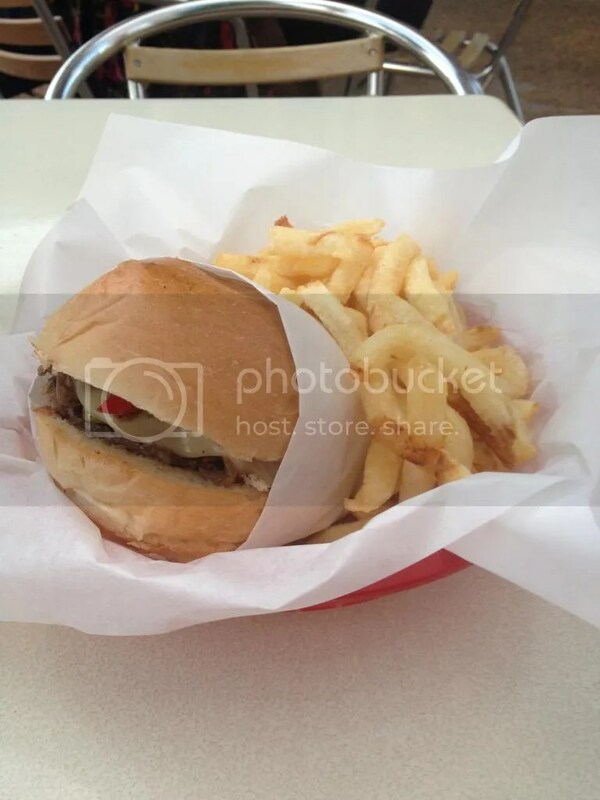 I went into The Oinkster on Wednesday with an open mind was met with a successful burger. The Oinkster triumphed where Jason Mraz failed by providing a new product I could really sink my teeth into. Pun intended. The Turducken was the best burger of the week. I particularly enjoyed the chicken breast. It wasn’t too salty, and it matched the other toppings well. The cherry gastrique provided a sweet, juicy jolt into the burger, but didn’t overpower the other more delicate toppings. My favorite topping though, was the relish. The rosemary paired perfectly with the chicken, and brought a unique herbal flavor to the burger. It really tasted like Thanksgiving. The duck pastrami, however, was mostly flavorless, and the burger patty itself offered even less. I’m noticing a pattern with The Oinkster. The flavor of the burger patty is consistently disappointing. 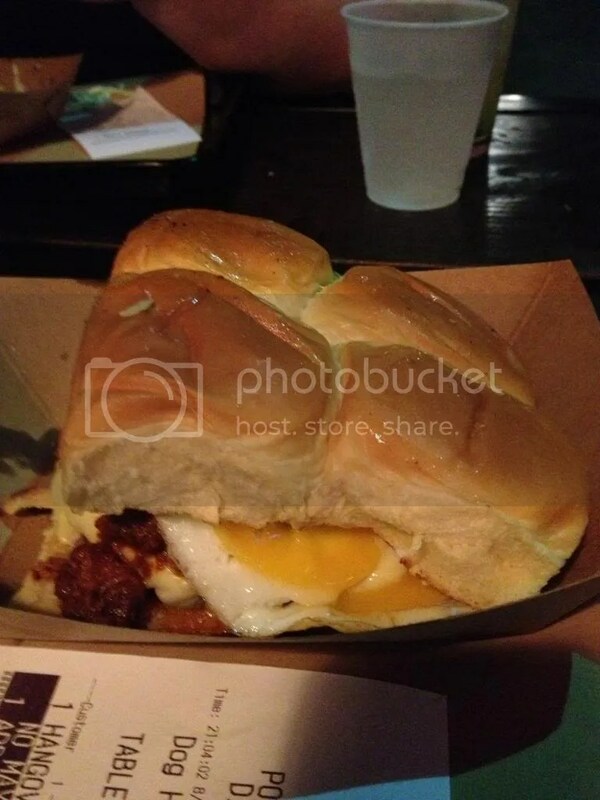 All things considered though, this was an enjoyable burger – one I would order again if it ever came out of The Oinkster’s Disney-like vault. In my last review, I wrote of my apathy for soccer. “I’m an American!” I boasted. “I don’t understand it!” I whined. And yet Sunday, as the World Cup came to a close, I was glued to the television, watching a match that would produce no goals until the 113th minute. A month ago I might have complained about a goalless soccer match, but today I’m completely swept up in the spectacle. Burger Week at The Oinkster could have swept me up in the same way. As far as burger-celebrating goes, Burger Week had a similarly grand scale. But I couldn’t buy in. The patties too flavorless, and the drinks too weak. When I woke up on Thursday morning with a terrible stomachache that would not subside until Friday afternoon, I decided to forego those burger offerings, and I felt no remorse. The Oinkster had done little to prove their burgers were worth the pain of continuing to eat them. So I took a two-day hiatus, and I would go on to skip Sunday as well. No, I’m not a Burger Lord, but I don’t think the title is worth the gastrointestinal pain. 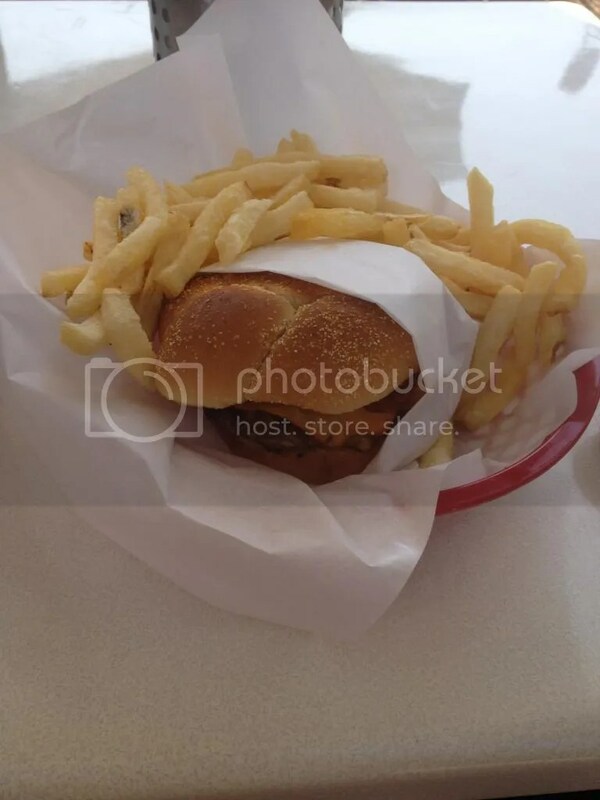 On the sixth day of Burger Week, the Oinkster gave to me The Smoinkster. The Smoinkster features a smoke-infused angus patty, topped with bacon, smoked cheddar cheese, smoked white onion, smoked ketchup, and fried pickles on a Kaiser bun. This ended up being my last burger of the week, as The Oinkster’s commitment to mediocrity shone in this burger like it’s brethren before it. Once again, the bun was hardly noticeable. The smoked ketchup was actually successful, though a little sweet. It put me in mind of the Hickory Sauce featured on my favorite burger at The Apple Pan. Ultimately, though, this comparison is the worst The Oinkster could have drawn for me, as the patties of each could not be further from each other in quality. 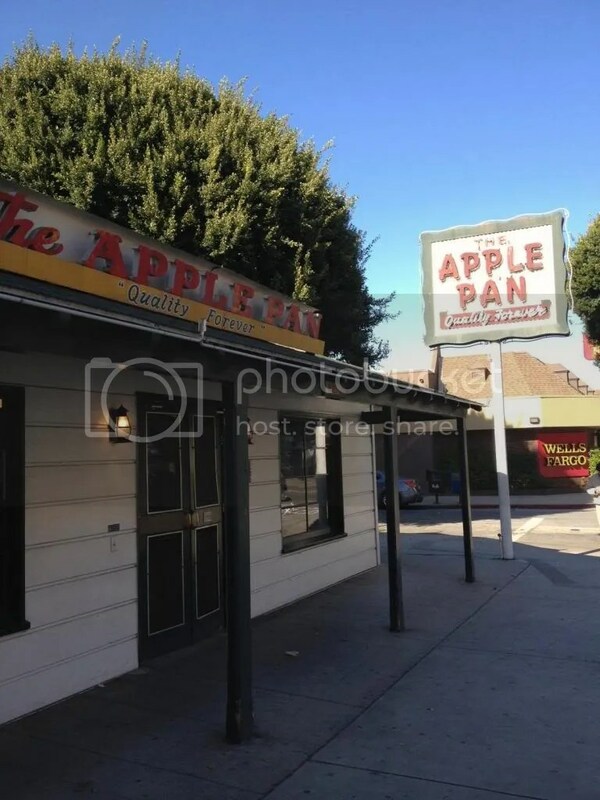 The Apple Pan features a smoky, uniquely flavored patty, but The Oinkster’s, per tradition, was quite boring. Instead of causing me to enjoy the Smoinkster, this smoky ketchup just made me long to be elsewhere. The smoked onions worked. The cheese really worked. The fried pickled weren’t the worst I’ve had. But all I wanted was a restaurant capable of combining these inventive ingredients on a delicious burger, and The Oinkster wasn’t up for the task. The Oinkster’s Burger Week is clearly fun. Each day I went was a celebration. Fathers lined up with their sons, each wearing armfuls of bracelets marking their achievements. Burger Week veterans sported hats and t-shirts gilded with pins of burgers old and burgers new. It would have been so easy to become wrapped up into the fun of it all – there was so much to enjoy. But all this show was proven for naught, as no burger impressed me enough to buy in. I wish a fun week to The Oinkster and their fans each coming year, but I will not be joining in. Perhaps I am no Burger Lord, but titles are rarely worth it anyway. So, readers, what burger joint deserves a burger week? And what team should I root for, now that I, inexplicably, enjoy soccer. As always, the comments are below. When I read that sentence, I laughed so hard I nearly choked on the deep fried mac n’ cheese I was eating. Look, I work at a College. I love a good mission statement. But at least make it kind of accurate. I know that reads as a criticism, but I don’t mean for it to. Well, I do mean it to, but it didn’t take anything away from my enjoyment of the restaurant. If anything, the ready availability of deep fried mac n’ cheese actually made me enjoy Hole in the Wall even more. Three sizeable lumps of macaroni and cheese, deep fried, and covered in a creamy house made cheese sauce. 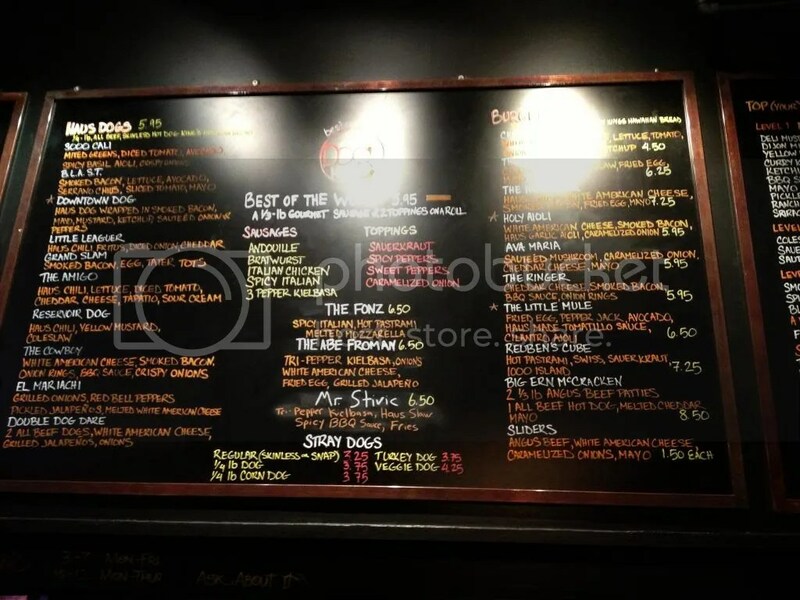 In fact, this emphasis on making things in-house – the cheese sauce, the ketchup, almost everything – contributes to Hole in the Wall’s mission to provide their patrons with healthy alternatives. According to Hole in the Wall it isn’t deep fryers and cheese sauce that is keeping us down. It’s corporate America. 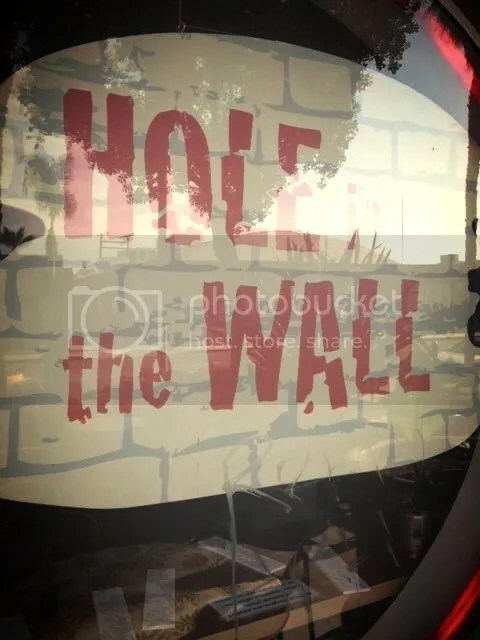 But was Hole in the Wall’s burger as revolutionary as their ideology? No, but that doesn’t prevent it from still being really good. I ordered a standard burger on a pretzel bun, with lettuce, tomato, cheddar cheese, and bacon. If you’ve read the blog before, you’d know that pretzel buns are trending upward in popularity, and for good reason. 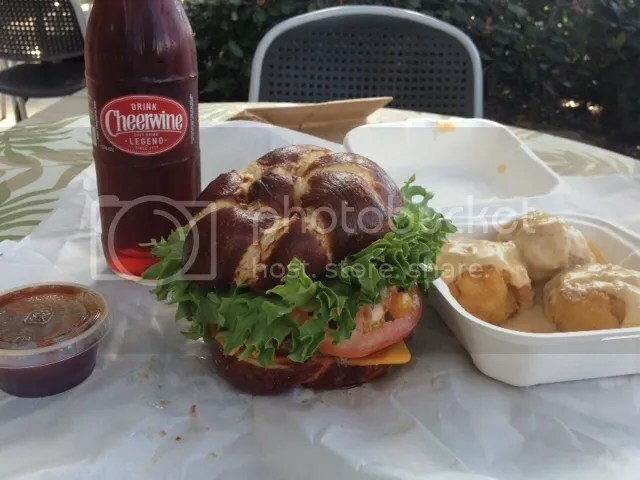 The bun was soft and doughy, and brought a healthy dose of, I don’t know, pretzel-ey-ness, to the burger. The patty was juicy, and the toppings fresh. Overall this was a really good burger. To top it all off, and Hole in the Wall gets major points for this, I washed it all down with a Cheerwine. Hole in the Wall offers a pretty great burger, with incredible deep fried macaroni and cheese and a healthy variety of rare bottled soda. Well, not healthy as in good for you, healthy as in… never mind. 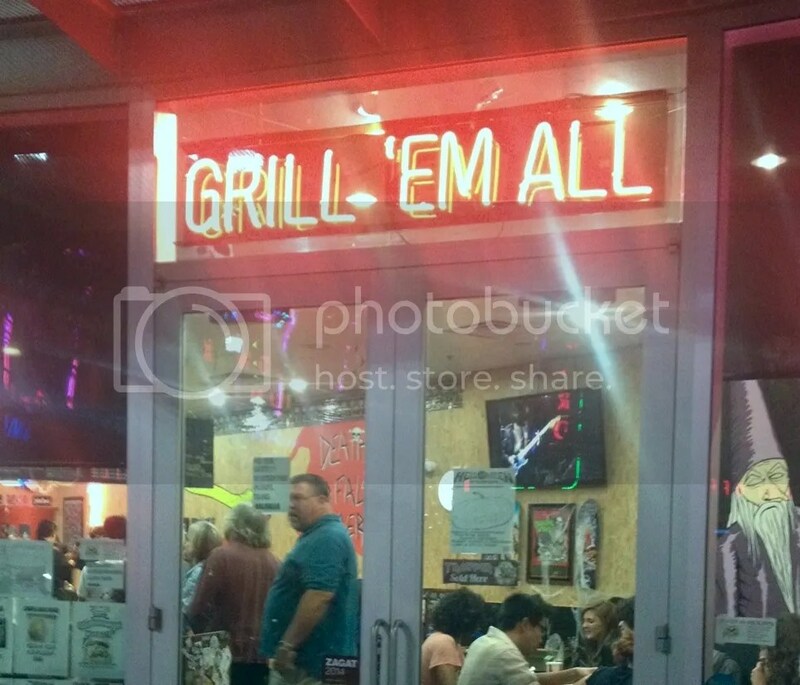 Grill ‘Em All is advertised as the hardest rocking burger joint in the Greater Los Angeles area. You could say I know a thing or two about the hard rock lifestyle – I got the Grill ‘Em All gift card I used on my trip while cat-sitting for my boss (Rock And Roll!). And, I must say, it delivers on its claim. Stepping into Grill ‘Em All is a step into the past, where jean jackets abounded and people actually respected The Eagles. 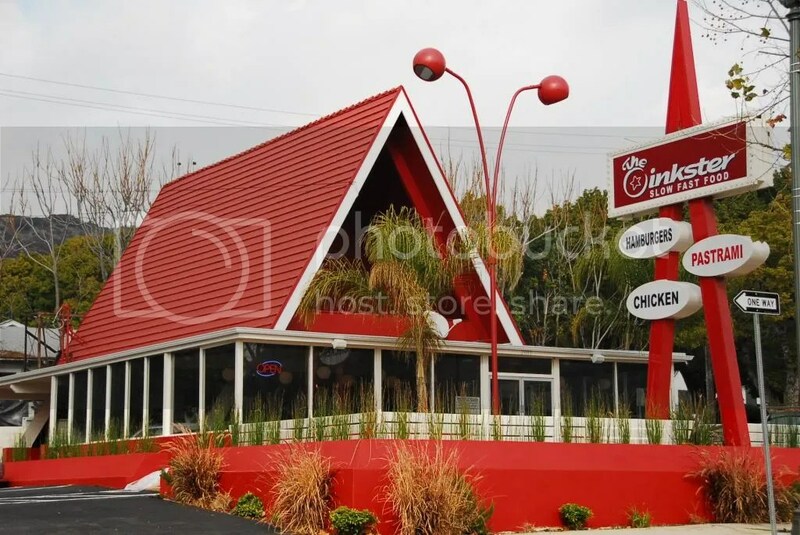 80’s Rock paraphernalia is slung across the walls, along with the bold proclamation, “Death To False Burgers” in a jagged, bold black-on-red mural. A hair metal documentary (rockumentary?) showed on the screens. But the comparison was too fitting, as Grill ‘Em All, like most hair metal, was all flash and no substance. 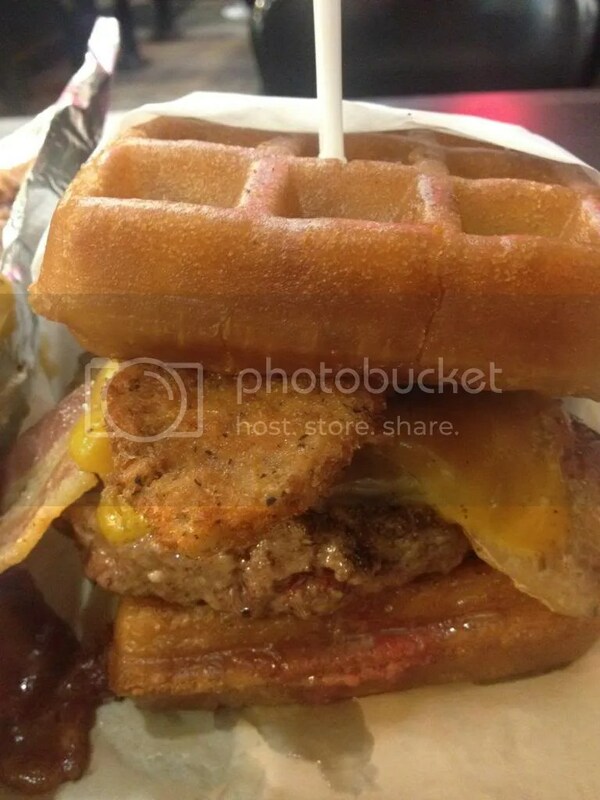 I ordered the “Jump In the Fryer”, a burger topped with cheddar cheese, bacon, fried chicken, and a maple-and-hot-sauce drizzle, situated between two waffles. 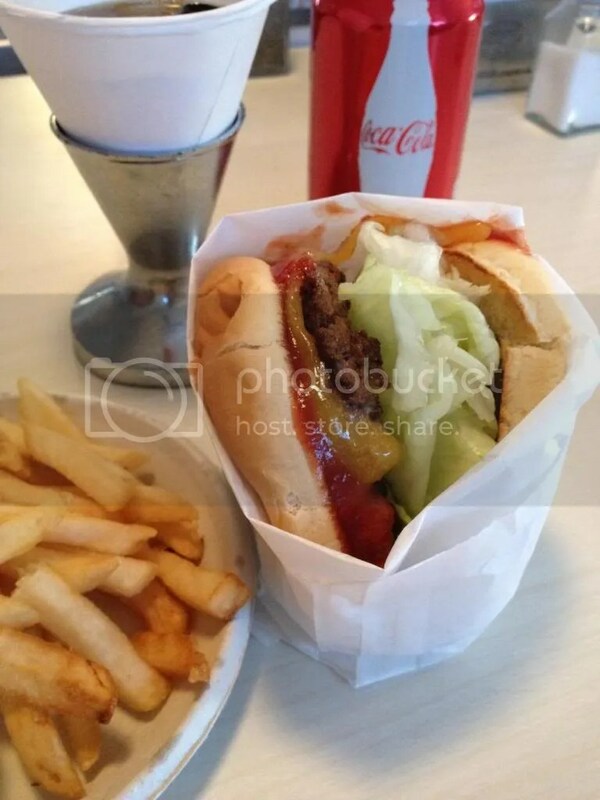 While this burger contained a great deal of unique items, each had one thing in common – salt. Fried Chicken is salty, bacon is salty, hot sauce is salty, even burger patties are typically seasoned with a dash of Morton’s. All this sodium made the burger a bit one note, and the waffles, which were soaked to translucency with oil, didn’t help. Perhaps I need to mind my preference for simplicity over complication when ordering my next burger. Despite my below-average burger, I have hope for Grill ‘Em All because they are responsible for introducing me to their anvil fries. Anvil fries are a play on poutine, which is strange, because there’s nothing less rock-and-roll than the French part of Canada. 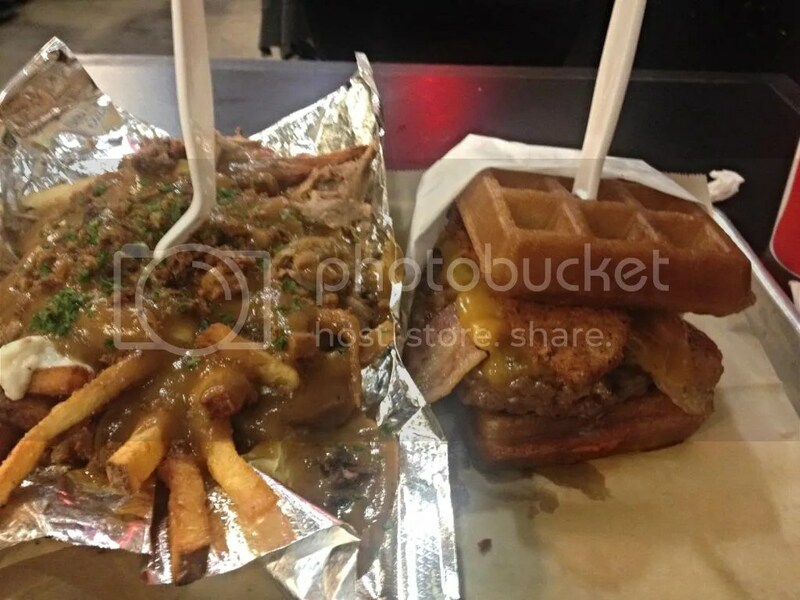 Grill ‘Em All’s anvil fries are topped with duck confit, cheese curds, duck gravy, and a sprinkling or crushed cracklin, or pork rinds, and they are truly special. Should you rush to Grill ‘Em All for a burger? Probably not, but it’s worth a stop for the anvil fries alone. What do you think? Am I wrong about Grill ‘Em All? Do you think I’m crazy because I don’t like music from the 1980’s? As always, let us know in the comments section. I ordered The Duke, a half-pound burger topped with lettuce tomatoes, red onions, pickles, grilled pineapple, and cheddar cheese. I asked for mine without lube, on principle, and ordered a side on sweet potato fries. The fries themselves were excellent. Truly, they were among the best sweet potato fries I’ve ever had. Crispy on the outside, soft and tender on the inside. They were a delight, and they paired extremely well with the sweetness from the pineapple on my burger. 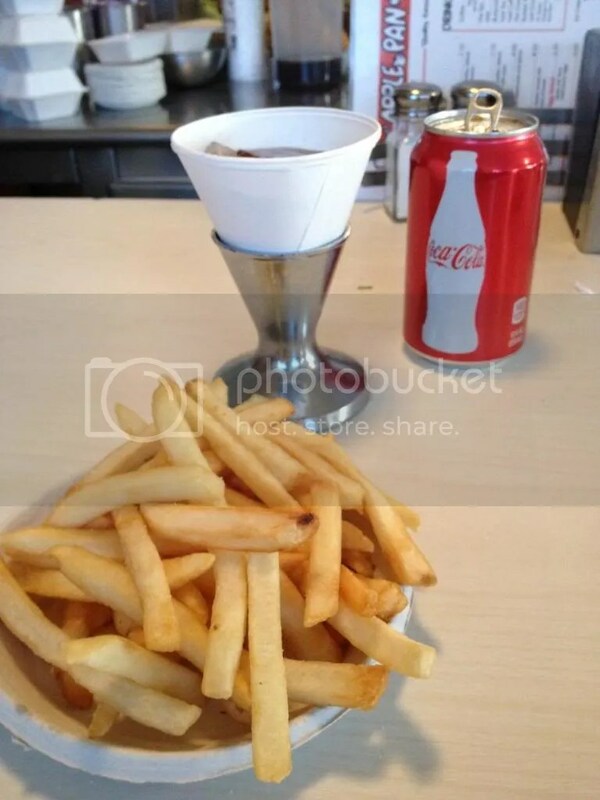 The quality of the burger matched that of the fries. 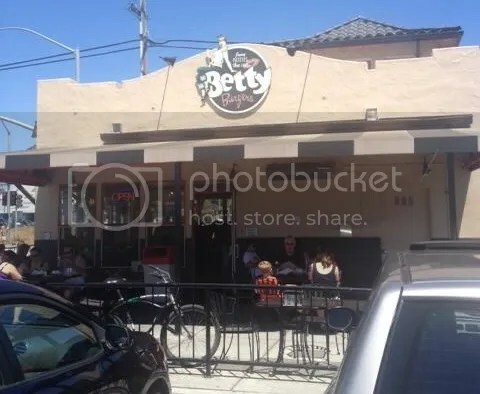 If I had to describe Betty’s in one word, the word would be “fresh”. The pineapple was thick and juicy, the vegetables refreshing in contrast with the heaviness of the bacon. I was expecting the raw red onions to overpower the burger, but they were a perfect compliment. And the pickles. The wonderful, long, pickles. I was afraid the tartness would clash with the pineapple, but it didn’t. In short, the toppings were simple in nature, but placed expertly. The bun was soft, but sturdy, and the patty itself was hearty and satisfying. As I said, Betty finished strong. After a string of disappointing burgers, I am pleased to present you with an excellent burger on National Cheeseburger Day. What are you doing to celebrate this important holiday? And, as always, tell us where we should be celebrating it in the comment section! Kate isn’t the only one who can take road trips. A few weeks ago, I drove up the coast on the endlessly beautiful Pacific Coast Highway to San Francisco. 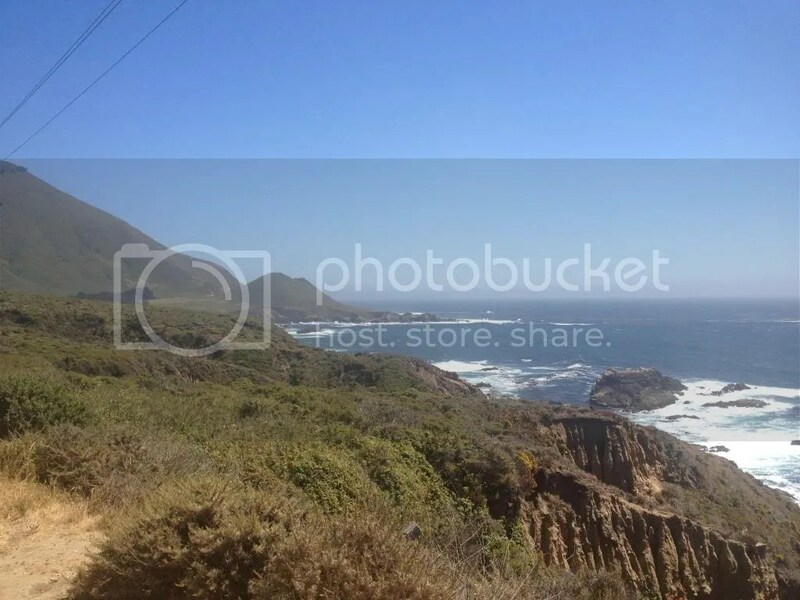 In case you’ve never heard of PCH, picture driving with this scene right next to you for seven hours. The view from my car during the trip was as unbelievable as the Bay Area itself. One great thing about this burger blog is that, when in new cities, I don’t have to aimlessly wander around looking for places to eat. Now, when I travel, I do so with purpose. I do research, looking for the tastiest burger in town. 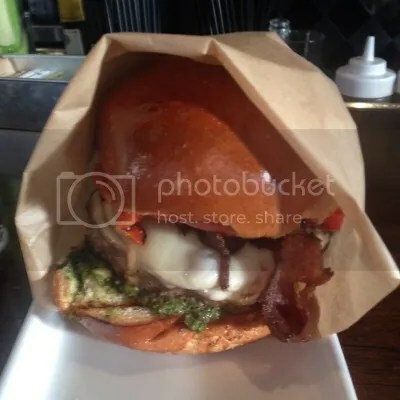 Given, burgers aren’t math problems with objective solutions; in a cultured city like San Francisco, there were obviously a great many tasteful burgers vying for the title of “city’s best”. Still, a few seemed to rise above the fray, so I picked one and set about to Zuni Café in the Hayes Valley section of San Francisco, CA. In previous posts, I have sung the praises of simplicity. Zuni, like The Apple Pan, has constructed a seemingly simple burger, in terms of the sheer number of ingredients. 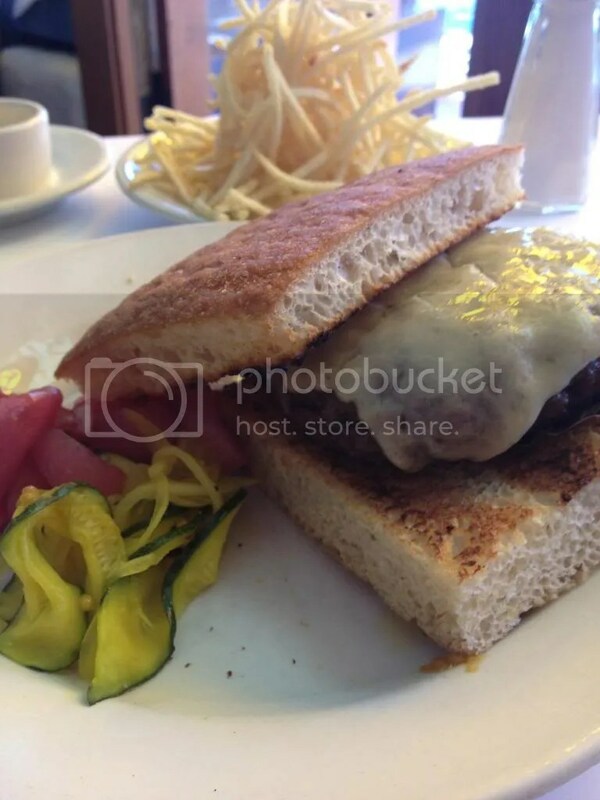 The only things that come standard on the Zuni Burger are pickles and aioli. I added cheese and asked for the aioli on the side. Did Zuni’s burger, in its simplicity, come close to the Apple Pan’s? In short, no. A million times no. The patty was obviously made with quality meat, but it had no kick. It was quite plain. The cheese was barely noticeable, certainly not worth the extra $1.50. And the pickles. The sad, sad pickles. It was clear they did their pickling in house, as their pickles were both cucumber and onion. The purple coloration of the onion added an interesting layer to the burger that I liked, but the enjoyment stopped there. The pickles tasted like a more mustardy bread n’ butter pickle, as opposed to the standard, vastly superior dill. 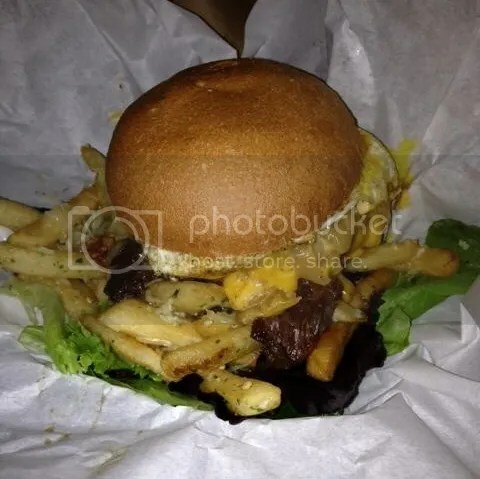 The strong flavors overpowered every other element in the burger with a faintly unappetizing zest. I was very disappointed. It was a burger without an identity. It strove for both simplicity and class, and landed at neither. Simple burgers are great, in my opinion, because there is something homey and classic about them. They just feel right. 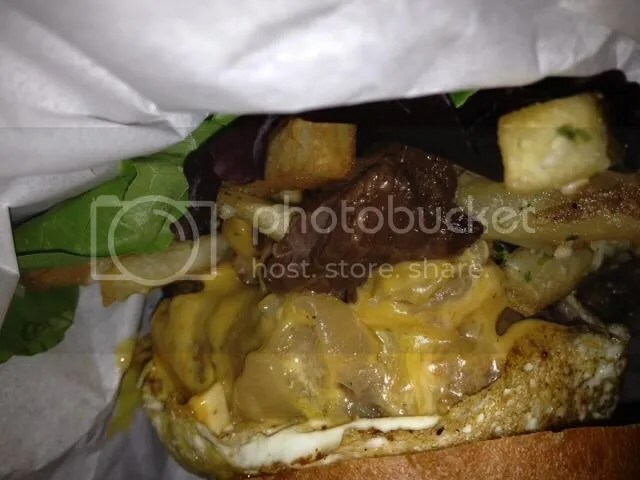 But any homey-ness in Zuni’s burger had been replaced with pretention. It tried too hard, and it fell even harder. Lastly, the price. I realize that living in a big city comes with higher costs, and I do my best to not complain about them. But this was just ridiculous. 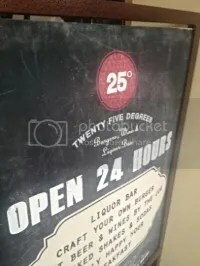 I had my burger with a side of thin, decent fries and a mojito – a meal that totaled over forty-five dollars. Yes, you read that correctly. Forty-five dollars. My Apple Pan Burger was one quarter of that cost. Of course, they don’t serve cocktails at the Apple Pan, but the price was outrageous still. This time, my research did not pan out. I am certain I did not eat the best burger in San Francisco, and if I did, I’m content to keep searching for great burgers in LA instead. But if I didn’t, I’m totally fine with finding another excuse to head north. So where did I go wrong, readers? 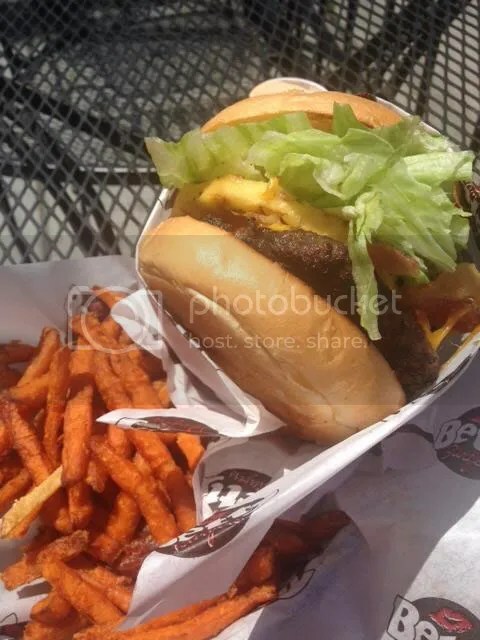 Is there a better burger by the Bay? And where should I go next in LA? As always, let us know in the comments! 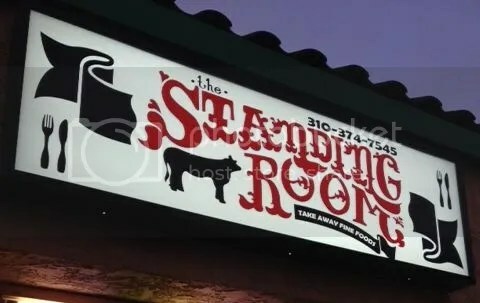 I would guess Stout in Studio City, CA is so named because their aim is to provide patrons with formidable burgers and robust beers paired excellently. Seeing as how there is an entire family of beers named “Stout”, beer is where I’ll start! I did not get a “Stout” beer. I can barely drink a mimosa without getting tipsy, so I opted for something a little more lightweight-friendly. Our waitress had a handful of beers in mind to be paired with each burger. You read that correctly – just as the fancy people who try to convince me that wine doesn’t taste like dirty mop-water like to pair different wines with their meals, Stout has committed to pairing different types of beers with each of their unique burgers. In my case, I was suggested a Chouffe Biere Du Soleil. If you don’t know what that means, that’s ok! Neither did I! 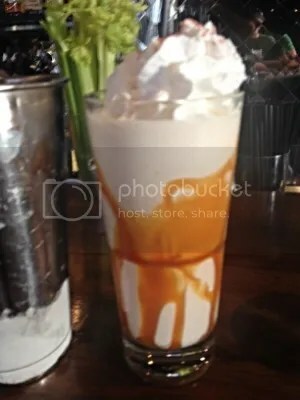 But it was fruity and a little sweet, and it totally worked with my burger. The beer portion of my evening was a wild success. 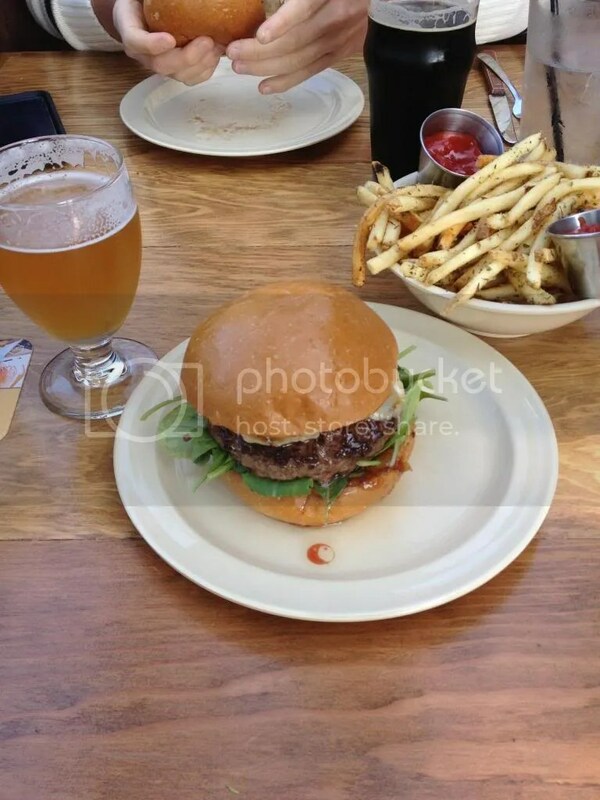 So if the beer was so perfectly paired, the burger must have really worked too, right? Yeah, I suppose so. 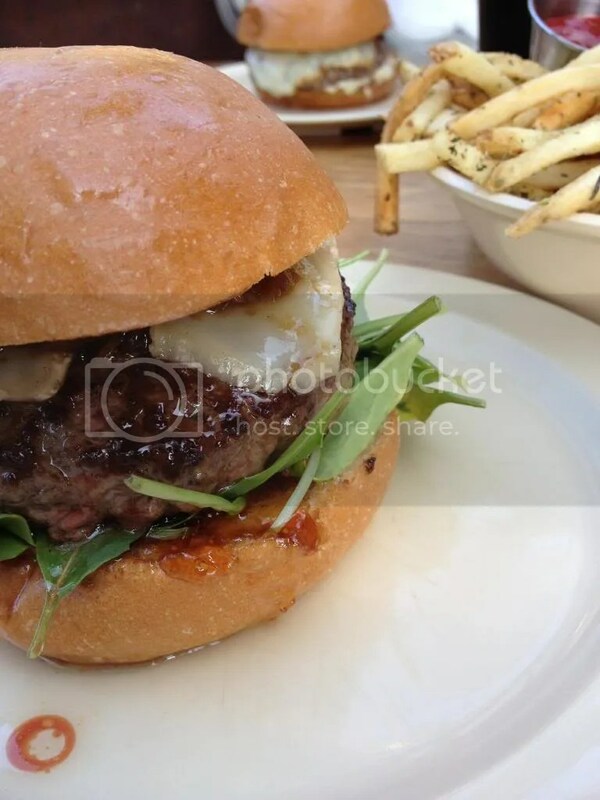 I ordered The Six Weeker, topped with brie, arugula, caramelized onions, and fig jam. And while the fig jam was my jam, I couldn’t shake the feeling that this was just another gourmet burger. There was nothing about it that excited me. The patty itself was ok, if under-seasoned. The toppings worked well together, but I had no Wow Moment. Stout’s burger was pretty good, but ultimately it was just another stop on the LA Burger Tour. I have no complaints, but LA has a lot to offer, and Stout just impactful enough to draw me back in. Final Verdict: Stout has decent burgers and exceptional beers, but if you’re in Studio City, there’s an Umami Burger down the street. Just go there instead.